Argentea Gallery’s latest exhibition is a cabinet of curiosities. 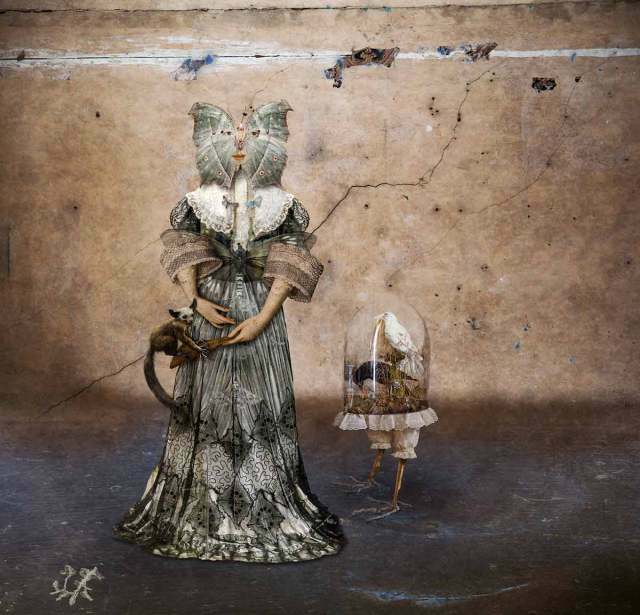 Automata, dolls, swan sisters and hybrid creatures invite the viewer into the entrancing and mythical world of Paul Biddle’s surrealist photographs. Paul Biddle is an award-winning English fine art photographer, whose playful images are defined by illogical combinations and absurd scenes. It is this disregard for the rational which shows the influence of the 20th century art movement Dadaism. Rejecting the Western emphasis on logic and reason, Dada artists created work that was anti-idealistic, challenging conventional notions of ‘high art’. Like Duchamp, famous for his ‘readymades’, Paul Biddle takes inspiration from found objects, such as a curled shell or a collection of moths, which he stages and assembles before photographing them in his studio. There is a dreamlike quality to his series ‘Cabinet of Curiosity’, which also shows the influence of Surrealism on Biddle’s practice. Another 20th century art movement, Surrealism was bound up with the psychoanalytical theories of Sigmund Freud relating to the irrational and instinctual drives of the unconscious. Paul Biddle’s clever and whimsical compositions show an artist delving into the realm of the subconscious. By releasing the unrestrained imagination his collaged images tear the familiar world apart, permitting it to be created afresh. Many of the works within ‘Cabinet of Curiosity’ feature mythologised, metamorphosed figures. A woman, in a flowing lace gown, has a butterfly head, a family of three have webbed feet. These photographs ask you to look closely, and find the unexpected in intricate details, such as a child’s arms turning into the neck of a white swan or her feet splayed out in the shape of starfish. These storybook characters are accompanied by those in Biddle’s series ‘Out of the Obscure’, which is displayed downstairs, and defined by jet black ravons and bright red apples. There is a classic fairy tale feel to these tableaux of creatures and items but the narratives are left open to the viewer’s imagination and emotions. Downstairs in the gallery is another series, ‘Fantasy Islands’. These striking black and white photographs evoke Giorgio de Chirico’s classical scenes, with statues from antiquity floating in mesmerising, rippling waters. These works play with perspective– tiny windmills, trees, figures and lighthouses balance on large hands, which appear like islands in the sea. he also plays with focus: some objects are clear, whilst others are more obscure, slightly out of focus, much as we find the entities which make up our memory. What is most uncanny about the exhibition is the difference in tone between, and even within, images, quickly moving between playful and serene to unnerving. Masked figures comprising both human and animal forms, fantasy islands constructed from corporeal dismemberment and dark enclaves used as a metaphor for the imagination, convey the enchantment and mystery of dreams that is universal. Paul Biddle has reimagined photography to create a captivating reality, which has been rearranged, and left for the viewer to interpret. The exhibition will run from 21st September – 21st October 2017 at Argentea Gallery, which is based in Birmingham’s historic Jewellery Quarter.